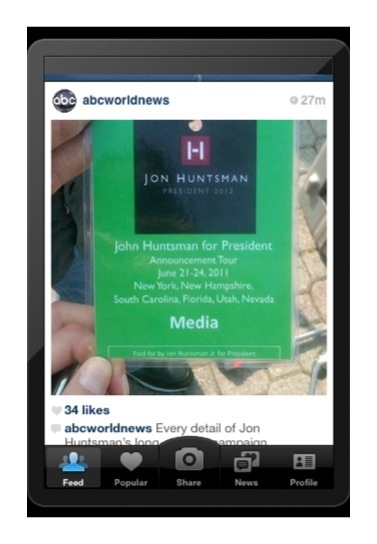 ABC World News snapped this photo at U.S. Presidential candidate Jon Huntsman’s campaign kick-off speech. The image shows an embarrassing typo on a press badge issued to an ABC reporter for the event. ABC posted the image briefly to photo sharing service Instagram before hastily removing it. However, they couldn’t delete it before yours truly was able to snap this screen shot. Can you spot the flub? This entry was posted in mobile updates, news, photos, shenanigans. Tagged abc, badge, campaign, communication, Huntsman, mobile updates, news, shenanigans, typo. Next Post Next post: 36 months later…and still married.